In order to further this discussion and better understand the reality of living in Direct Provision, a witnessing event is being held in Glencrow Hall, Moville on Saturday 9th March at 3.30pm. The event will begin with a performance by Donal O’ Kelly of his piece on Direct Provision. Donal O’Kelly is a playwright and actor. In 1999, when the Direct Provision system of asylum seeker accommodation was first mooted by the Department of Justice as a temporary measure, he wrote a poem to challenge its introduction and performed it around the country. Last year, he revived and rewrote that poem as Direct Provision marked eighteen years in operation. He’ll perform the poem and talk about facets of the Direct Provision system, including the current limits on the right to work. Donal’s performance will be followed by first-hand testimony from Donnah Vuma. 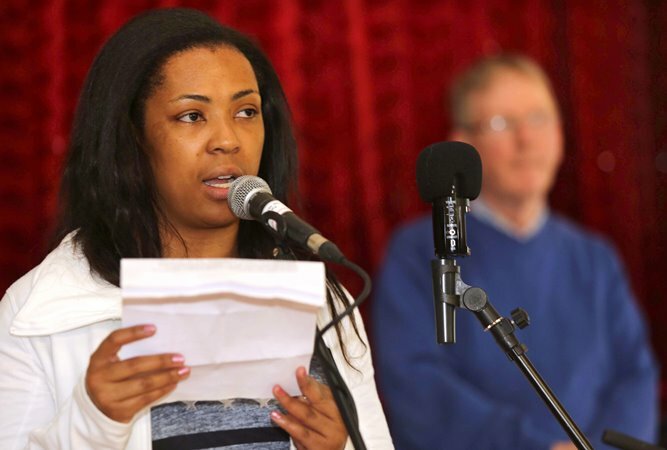 Donnah, originally from Zimbabwe, has been living in Ireland for several years in the Direct Provision system with her three young children. She is a board member of the Human and Earth Rights organization, Afri, as well as a member of MASI (Movement of Asylum Seekers in Ireland). The event is an informal one. Everyone is welcome. Entrance is by donation with all proceeds going to the local St. Vincent De Paul Society. 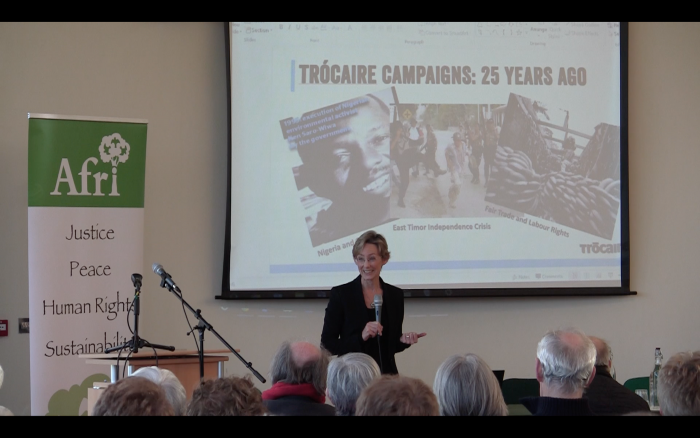 ‘We’ve won campaigns and had successes and we must celebrate and remember these as we take on the challenges that lie ahead’, so said Trócaire Director Caoimhe de Barra, setting the tone for Afri’s Féile Bríde Conference, 2019. She recalled East Timor’s long campaign, and the genocide perpetrated against it, and how it eventually gained its independence, with much support from around the world, especially in Ireland. Caoimhe also referred to other successful campaigns, like for example creating market access for Fair Trade products, whereby you can now find fair trade tea, coffee and bananas in many supermarkets –something that was unthinkable 25 years ago. She recalled the success of the Jubilee campaign, which brought about the cancellation of debt, lifting the burden off the backs of some of the poorest countries in the world. She recalled how significant advances have been made in poverty reduction; in participation by children in Primary education; in gender equality; in access to clean water and in reducing the mortality rate for children. ‘This shows us that progress can be achieved in a generation’. In concluding her talk, she quoted from the founding document of Trócaire which states: ‘Let us never get accustomed to the injustices in this world…and let us never grow weary in the work of setting it right.’ ‘’My wish for everyone here is that we never grow weary; that we see the successes; we see the progress; we see the challenges but that we never grow weary of the work in hand’. Next up, Richard Moore, spoke about ‘Educating the Heart’ – the cultivation of the knowledge, skills, attitudes and values necessary… for a compassionate citizen’. Richard spoke about ‘educating the heart’ through the prism of his own story. He said his aim was to acknowledge the things in his life that made it possible for him ‘not only to survive being shot and blinded at the age of ten but to actually see blindness as a positive experience’. ‘When you are blind you meet people in a different way’. You experience kindness and love, at first hand. Having experienced such tremendous love and compassion in his own life, as a result of being blinded he wanted to share that experience with others. ‘What I wanted to do was give back the kindness and compassion that was shown to me. He has done this in many ways, including through the work of Children in Crossfire, which he founded in 1998. Michael Doorly began by asking us to ‘press pause’ on our fears and frustrations and consider some positive news from recent years. For example, every day, last year, another 305,000 people were able to access clean water for the first time; never has child deaths been less common; never before have so many people been literate or lived such long lives. Quoting the journalist Nicholas Kristoff he said ‘despite all the information out there, never have people been so misinformed. And he went on to say that ‘a failure to acknowledge progress leaves people feeling hopeless and ready to give up, while recognising gains made will show us what is possible and spur us on to more’. Looking at ‘education for liberation’, Michael said that the problem with elitist education is that we are teaching ‘more and more to less and less’. The purpose of education should be ’to empower and liberate’ and we should start by listening. We need to recognise the strengths and resources that people already have and work with them to develop more’. He referred to the funding deficit for education – there is a $39 billion shortfall in the budget to provide good quality primary education for all. Though this might sound substantial, it is less than half the budget for just one weapons system – the stealth bomber, which is $90 billion. Meghan Carmody represents a new generation of activists with passion and determination to see our world transformed. Meghan said that the energy for action among young people is really growing and she profiled many young activists to emphasise this point. Under the Schools Climate Action Network, young people are mobilising and striking out for real change in policies and political priorities. Meghan spoke about her work in Friends of the Earth which includes the solar schools project – persuading and supporting schools to place solar panels on their roofs to demonstrate the value of this form of alternative energy. Already schools in every province are involved in a pilot scheme which will be built on in coming years. Meghan’s role is to build activism and leadership to bring about the political will to implement the solutions that exist. A highlight of the day was an intervention by 10-year old Ruby Jo, who is part of a climate action group in her school called ’There is no Planet B’, which, appropriately was launched on Feb. 14th, Valentine’s Day. Finally we had Brigidine sister Kay Mulhall who set up the Tallaght Intercultural Drop-in Centre in 2003, the focus of which is to welcome migrants and refugees who are seeking to make their home here. The Brigidine community supported the setting up of this centre. The Centre aims to be a warm and welcoming place where new communities can meet and get to know one another. Kay started her work by listening to the needs which the migrants expressed. Kay says she firmly believes that societies are enriched by sharing cultures, language, food, art and music. The aim of the centre is to build bridges…not walls. Language was identified by migrants as an extremely important skill to have. 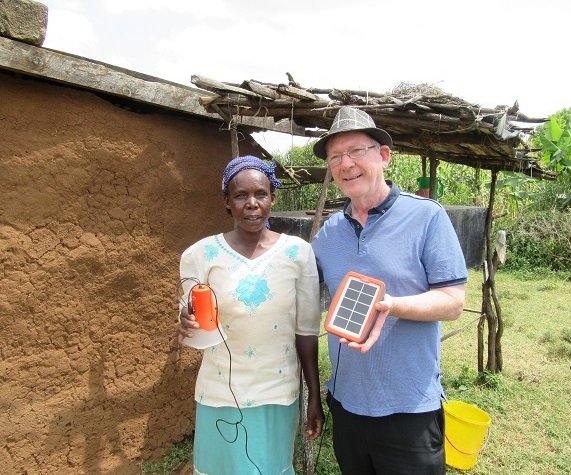 I had the privilege of visiting Kenya this summer and meeting some of the people who’ve received solar lights as part of Afri’s partnership with Development Pamoja. I was amazed at the difference that a small and relatively inexpensive solar light can make to people’s lives. In the company of James and Maasai from Development Pamoja, we visited many homes where the light was shining and were told of the benefits it had provided. For example, Christina Sote (see short video on our YouTube channel) uses it as a torch, if she hears rustling outside after dark, she can check to see if there is a snake about. She also uses it when she is cooking, to help her grand children when they are reading at night as well as to charge her phone, saving her a walk of many miles, which she used to have to do. Likewise, 28 year old Judy Chelangat lives in the village of Lomolo with her eldest son, Matthew who has a disability. Judy says the solar light helps her to care for her children in the evening, helping with cooking and other chores. The solar panel also enables her to charge her mobile phone and to keep in contact with the local clinic regarding Matthew’s health. We also met Oscar Kiprotich, who is thirty four years old and has suffered from multiple sclerosis for fifteen years. Oscar, who is wheel chair bound, lives with his mother and twelve year old niece Florence. The solar lamp allows Oscar to read in his bed in the evenings. It also enables him to assist Florence with her homework when she returns from school. In the context of a world facing the threat of climate change, this is a small but significant way of positively impacting people’s lives, in a way that is viable and sustainable and provides an example for all of us – in our fossil fuel addicted society. “It was absolutely brilliant” was one of the comments made by a student participant in the 2018 Hedge School. 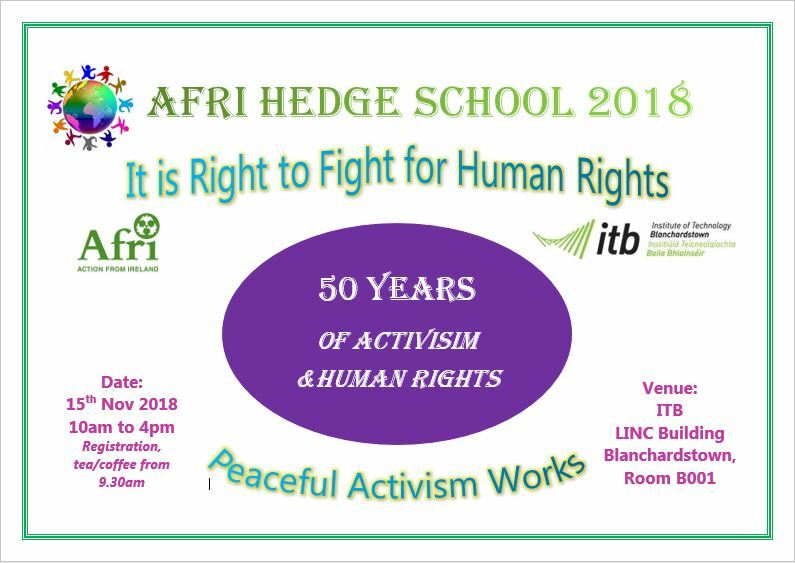 The event took place in IT Blanchardstown for the 6th year in succession under the title ‘It is right to fight for human rights’. 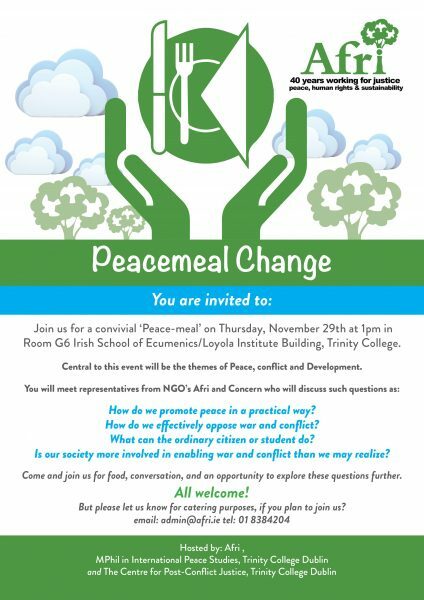 We had inspirational presentations from Emmet Sheerin of Trócaire, actor and activist Donal O’Kelly and representatives of the Rohingya people. Emmet showed a short film and spoke about the extraordinary student-led ‘Divest’ campaign, which resulted in three Universities, Trinity, NUI Galway University and Queens in Belfast committing to divesting in fossil fuels; Donal O’Kelly outlined the history and context in relation to the forced migration of people and the Rohingya told the horrific story of what has happened to them at the hands of the Burmese military. There was also great student participation, as usual, with wonderfully creative drama pieces, powerful music and poetry. All together a highly successful Hedge School, summed up by another student who said “a fantastic event. Hope the Afri Hedge School continues for many more years to come. It is Invaluable”. 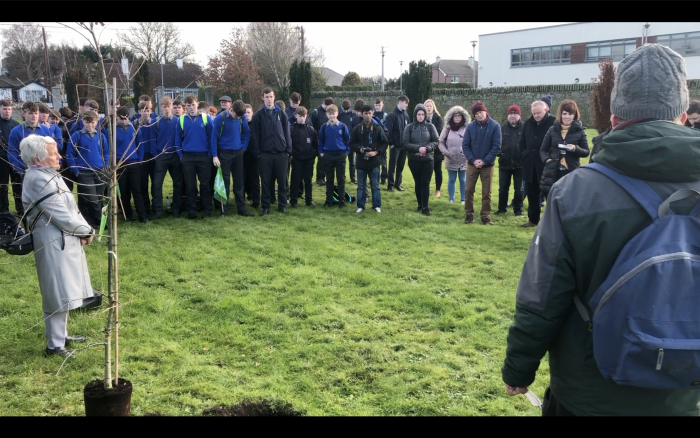 Contributions from Donal O’Kelly – ‘Welcome the Stranger’; Emmet Sheerin (Trocáire) ‘Student Activism – A Success Story’ and 3rd year Community and Youth Development students in I.T. Blanchardstown. Free entry to all – donations welcome to cover costs. Lunch and tea/coffee is provided. 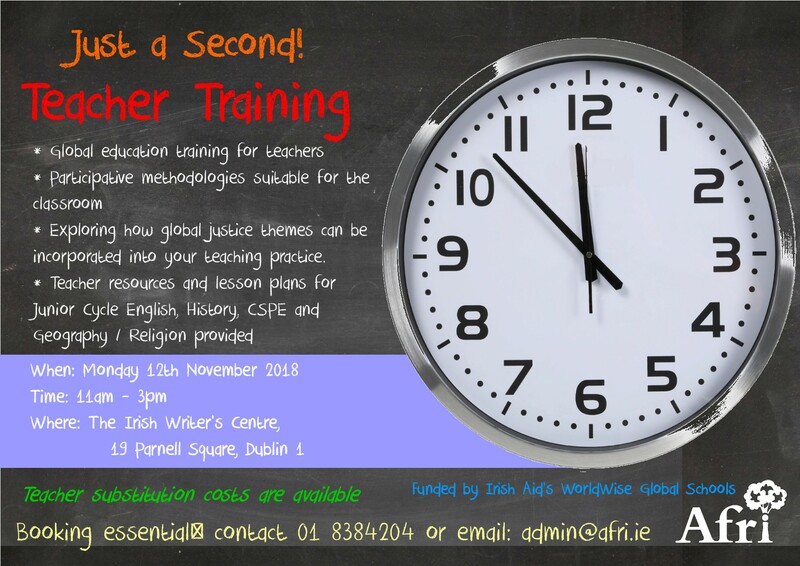 Afri’s ‘Just A Second!’ teacher training for secondary school teachers takes place 12th November 2018 from 11am to 3pm in the Irish Writer’s Centre, 19 Parnell Square, Dublin 1. The training is an energetic, creative and informative experience, demonstrating effective ways of bringing global issues into the classroom. The training is led by a global education expert together with Pete Mullineaux, a leader in the field of combining drama and global education, and author of Just A Second! Exploring Global Issues Through Drama and Theatre. Teacher training resources will be provided – including lessons plans for a number of Junior Cycle subjects including English, CSPE, History and Geography. Teacher substitution cover is available and a light lunch is included in the training as well as a copy of a new educational resource for teachers published by Afri. Booking is essential to ensure a place. 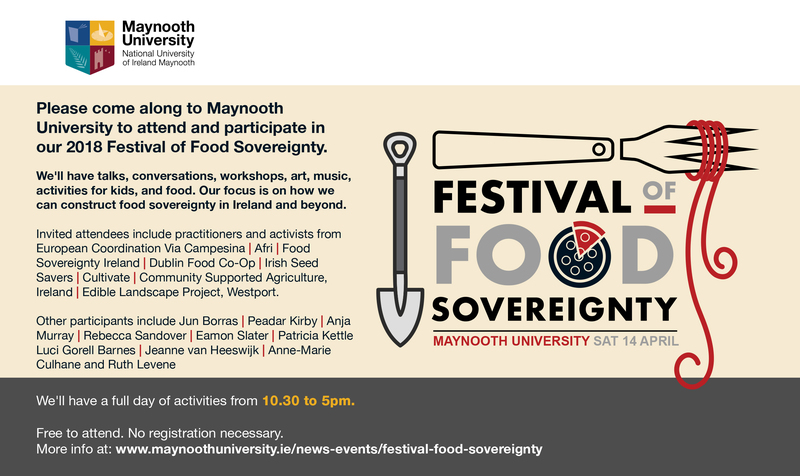 Contact Afri at admin@afri.ie to express an interest and fill out a registration form. Registration forms should be returned by 15th October. If booking after that date please contact the office directly on 01 8827563 or by email (admin@afri.ie). 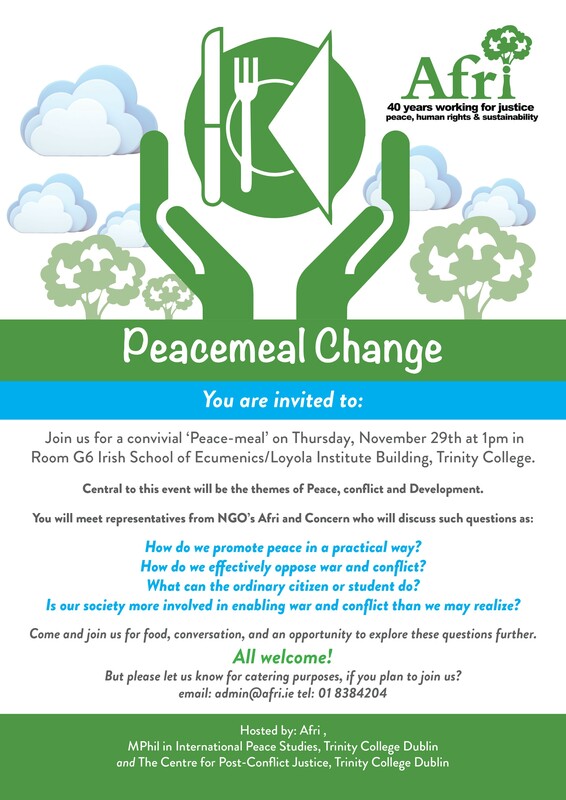 Nicola Peel is an award winning environmentalist, filmmaker, speaker and solutionist. Nicola has been working in the Ecuadorian Amazon for 18 years on a number of environmental and social projects. Finding solutions to oil spills with fungi, building rainwater systems for indigenous people suffering from contamination due to the oil industry, training farmers in agroforestry to prevent the slash and burn of tropical rain forests and cleaning the beaches of tons of plastic, turning rubbish into a resource. Nicola’s focus has been to find practical solutions to respond to those in need who are suffering due to resource extraction, poverty and climate change. She believes that ‘nature is our greatest teacher’ and during her presentation she will give examples on some of the solutions found in Nature. WeCreate, Cloughjordan, Thursday, 16th August, 7.30pm. The 2019 Walk will take place on Saturday, May 18th. 1. Registration takes place in the local town hall in Louisburgh. 2. This will be followed by the opening ceremony, which will last approximately 20-25 minutes. 3. Shuttle buses will take participants to the start point, following the opening ceremony. 1. The walk is 11 miles (approx. ), walkers should walk on the left-hand side. 2. A shuttle car will be available during the walk for anyone who gets into difficulty. 3. No parking is available at Delphi Lodge. 4. Dogs must be kept on a lead. 5. Portaloos are available along the route. 6. There will be a tea/coffee (no food) station at the half way mark (approx). 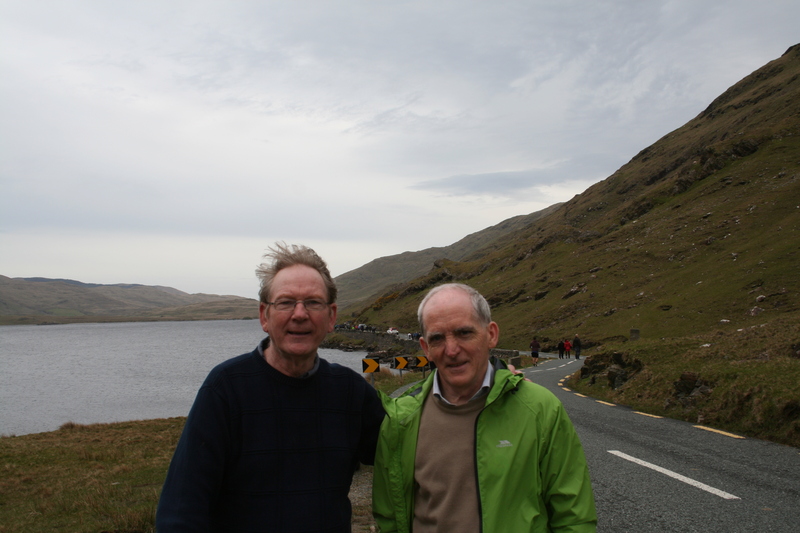 2018 marked 30 years of the Doolough Famine Walk and was attended by around 300 people. 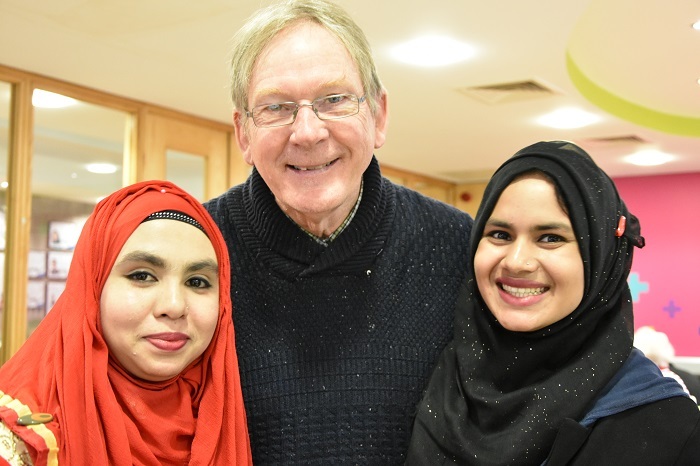 The weather was good and the day was memorable with inspirational words from Richard Moore and Fatin al Tamimi and stunning songs and music from Lisa Lambe and Nigel Linden. Here is a short film which captures how the walk went. Michael Davitt is one of Ireland’s great unsung heroes. His work and commitment produced extraordinary results around land ownership in Ireland. He influenced such people as Mathatma Gandhi and is strongly associated with ‘boycott’ – a non-violent methodology which is a relevant as ever in the world today. In 1996, Michael Davitt’s granddaughter, Gráinne, joined Marciana Funez and Christy Moore as leaders of the Famine Walk. Saturday 19th May 2018 will see the 30th anniversary of the Doolough Famine Walk. 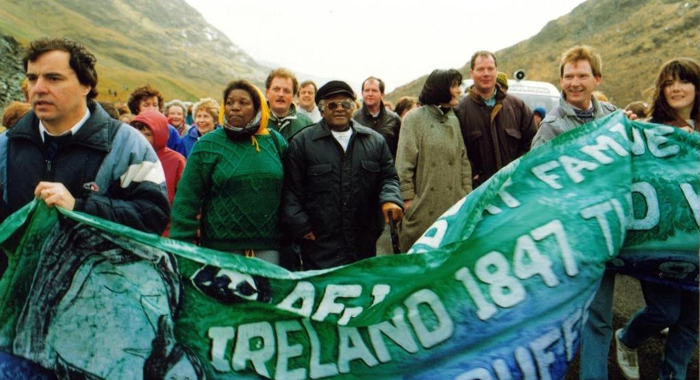 Afri first organised the walk in 1988 to commemorate the Great Hunger of 1845-50. 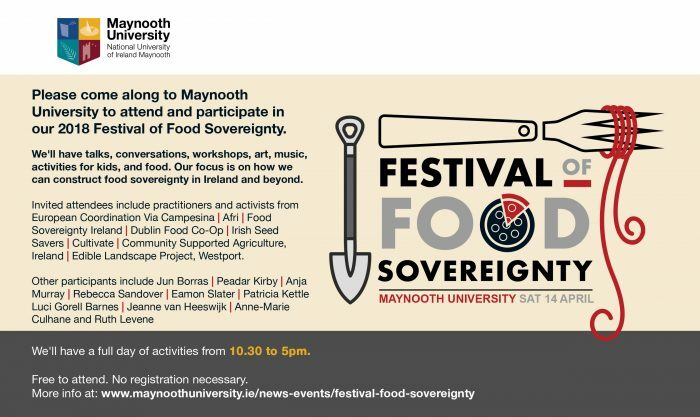 Regions such as Mayo illustrated how a natural setback such as potato blight can mutate to disaster in the context of unchecked market forces, lack of democratic structures and resources, and a pitiless, moralistic ideology. While some £9.5 million was eventually spent on late and poorly-designed ‘Relief’, £14 million went to sustain the military and police forces. Our walk retraces a journey of horror which occurred on 30th/31st March 1849. Two poor-law commissioners were to assess people in Louisburgh, entitling them as ‘paupers’ to meagre relief rations. The inspection never happened, but the people were instructed to appear at Delphi Lodge at 7 the following morning. They walked the hilly road in wintry, even snowy, conditions. At Delphi Lodge they were refused food, or admission to the workhouse, and so began their weary return journey, on which many, even hundreds, died. 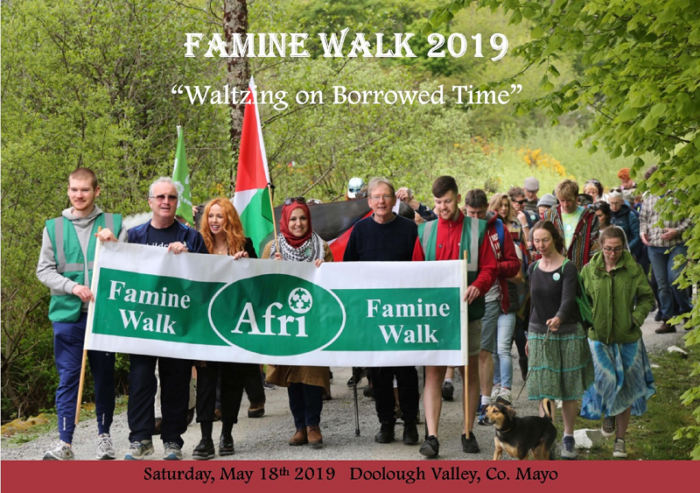 2018 is also significant in that it marks the 70th anniversary of the Palestinian Nakba, and in this context, we are honoured to welcome Fatin Al Tamimi, Chairperson of the Ireland-Palestine Solidarity Campaign. Sonia, ‘Sunny’ Jacobs and Peter Pringle are both death row survivors. Sunny was exonerated in 1993 after 17 years in Prison while Peter had his conviction quashed in 1995, having spent 14 years in prison. They met in Galway while campaigning against the death penalty and are now married and living in Connemara, where they’ve established The Sunny Centre to help other death row survivors and those who’ve been wrongfully convicted. 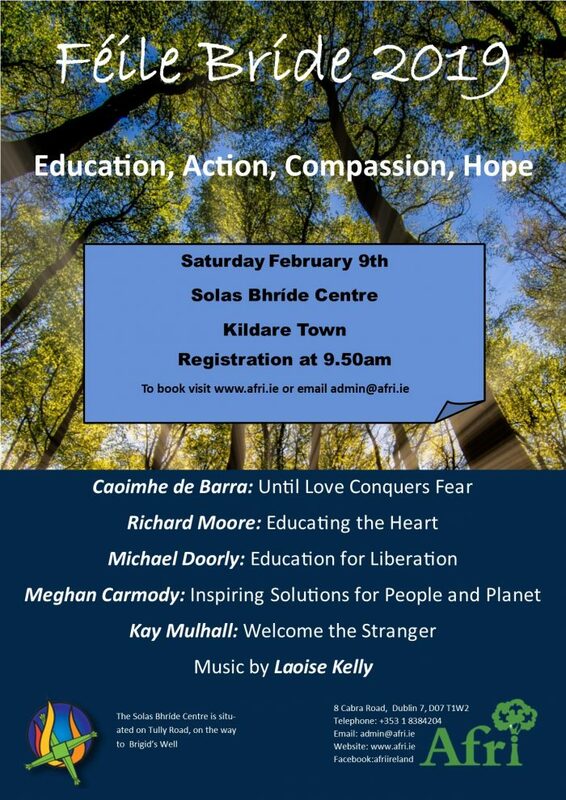 They spoke at Afri’s Féile Bríde ‘Light out of Darkness’ in Kildare on February 3rd, 2018.